Smartphone Dangers: Could Your Cell Phone Be Bad for Your Health? You carry your smartphone with you wherever you go. You have it on you at school, work, and while out shopping and running errands. Some people even carry their smartphones into the bathroom (not recommended)! Smartphones harbor viruses and bacteria like E. coli that can make you sick. Use alcohol-based wipes that are safe to use on electronics and wipe down your smartphone at least once daily to remove dirt, dust, and germs. Looking down at your smartphone while texting and browsing strains neck muscles and may lead to knots or spasms. It may even lead to nerve pain that radiates to the back, shoulders, or down the arms. Take regular breaks at least every 20 minutes when you are texting or browsing on your smartphone. Maintain good posture and do not hunch forward. Hold your phone higher when you are using it. Proper smartphone ergonomics helps prevent injuries associated with smartphone use, a common public health consideration. Do regular exercise that strengthens and stretches muscles like yoga and Pilates. Any position that involves bending the neck in an awkward position for a prolonged period of time may result in neck pain, including holding your smartphone between your shoulder and ear. If you are in this position for too long, neck pain may result. If you must be in this position while talking on the phone, take frequent breaks and move your neck to avoid getting stiff. If your neck cramps up, rest and put a heating pad on the area to combat tight muscles. Over-the-counter pain relievers can decrease pain and stiffness, too. If the pain lasts for more than a few days, talk to your doctor. It is very dangerous to text while driving. Texting while driving distracts you from what's happening on the road. It just takes a few seconds of inattention to lead to an accident. In 2015, nearly 3,500 people were killed and approximately 391,000 people were injured in car accidents involving distracted drivers. Some states have laws that ban cell phone use while driving. Other states require hands-free use of cell phones while driving. It is a misconception that it is safe to talk on the smartphone while driving. It is not safe. 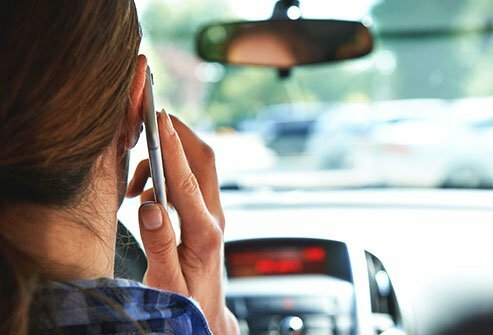 Talking on the phone while driving leads to something called cognitive distraction. This type of distraction takes your mind off the road, so even though you may be using a hands-free device that allows for voice-activated dialing and operation, your mind is not on the road. Your eyes and brain perceive what's around you when you're talking on a cell phone while driving, but you don't really see your environment. 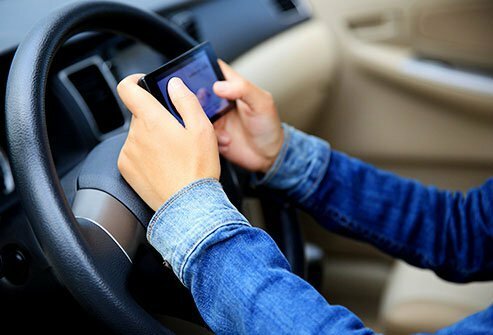 Talking on a smartphone while driving greatly increases the risk of car accidents. If you must make or take a phone call while driving, pull over on the side of the road. Shorter wavelength blue light that is emitted by smartphones, lights, and computer, tablet, and TV screens causes damaging health effects. Exposure to this wavelength of light disrupts circadian rhythms. Exposure to blue light after the sun goes down interferes with sleep. Blue light may contribute to heart disease, obesity, diabetes, and other health conditions. Minimize your exposure to unnecessary light, including smartphone screens, after dark. You will also sleep better if you get a lot of exposure to natural light during the day. Walking while texting or surfing on your smartphone is a danger. 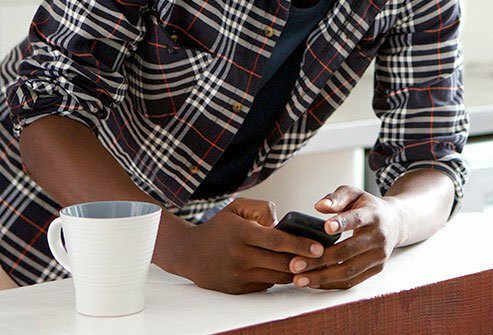 You may think it's okay to compose a quick text while you're walking out and about, but in that time you could step into a busy intersection, trip and fall, or run into something. Surprisingly, 52% of accidents where people are walking while distracted by smartphone use happen at home. Accidents may include broken bones, head injuries, and muscle and tendon strains. Sit down or stand still when you need to make a call, send a text, or talk on your smartphone. Some people worry that cell phone use is associated with brain tumors, brain cancers, and other types of tumors and cancer. Evidence from epidemiological studies do not show a link between smartphone use and these conditions. If you have concerns about the ionizing radiation emitted by cell phones, limit the amount of time you use them. If you would like to minimize your exposure to cell phone radiation, talk on the phone in speaker mode or use a headset. The Interphone study was a case-control study examining the effects mobile phone use on brain tumor risk. The study found that there was no increase in the risk of two types of tumors, glioma and meningioma, observed with the use of cell phones. 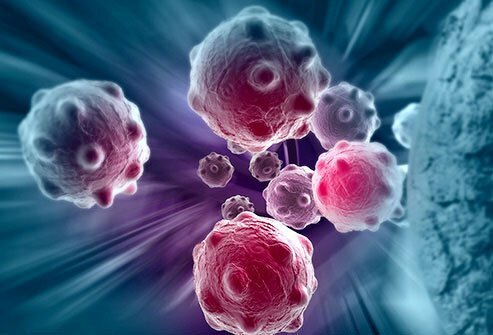 The study suggested there was an increased risk of glioma with the highest exposure levels, but certain biases and error with the study mean that a causal interpretation could not be made. 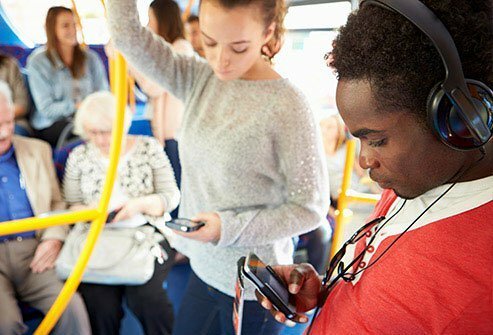 The potential health effects of heavy, long-term mobile phone use need to be investigated further. If you are still worried about radiation emitted from smartphones, use a corded headset or earpiece during phone use. Choose a cellular device that has a low SAR rating. SAR stands for specific absorption rate. It is a measure of the rate that the body absorbs radiation during cellphone use. The amount of radiation the body absorbs from cell phones is dependent on more than just the SAR rating. Cordless phones (wireless phones, including base stations), microwave ovens, and cell towers are other sources of electromagnetic radiation in our environment. Excessive texting on your smartphone or smart phone may lead to trigger finger or trigger thumb. This is a condition where the thumb gets stuck in a bent position and then snaps or pops when you try to straighten it. The condition is caused by inflammation of the tendon in the thumb. Inflammation inhibits the ability of the tendon to slide freely with movement. In addition to stiffness and popping, the affected thumb may be tender as well. If you develop this condition, rest your thumb and minimize texting to allow the problem to subside. 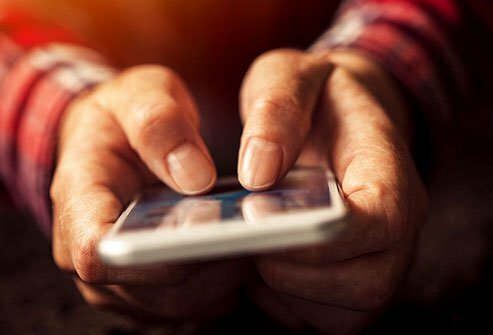 Excessive smartphone use may be associated with increased symptoms of thumb arthritis. The condition includes tenderness and pain at the base of the thumb. Gripping your phone and texting with your thumb may make the pain worse. There is no cure for arthritis, but rest, pain medication, and wearing a splint may help relieve symptoms. Although there are many types of arthritis, the most common type of arthritis that affects the base of the thumb is degenerative, "wear-and-tear" arthritis. This is also known as osteoarthritis. Cubital tunnel syndrome is a condition in which the ulnar nerve in the elbow becomes compressed. This leads to numbness and tingling in the outside of the hands, including the ring and small fingers. The forearm and elbow may be painful as well. You may develop this condition if you lean on your elbows while texting or you bend your elbows while holding your phone to your ear. Save your elbows and avoid pain by cushioning your forearms on hard surfaces. Avoid bending your elbows for long periods of time. Take frequent breaks and move and stretch your arms regularly. Wear a splint at night to keep your arms straight if you need to. 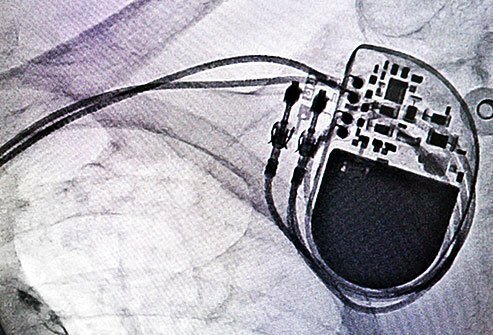 Smartphones may disrupt medical devices like pacemakers and implantable defibrillators. The interference may make the devices malfunction. Mobile phones may even interfere with some types of hearing aids. See your doctor if you suspect smartphones and smart phones are interfering with the function of any of your medical devices. Imaging tests like MRIs and CT scans and security scanners used in airports may also interfere with medical devices. Short wavelength blue light emitted by smartphones and other types of screens can cause health effects like eye strain and pain. 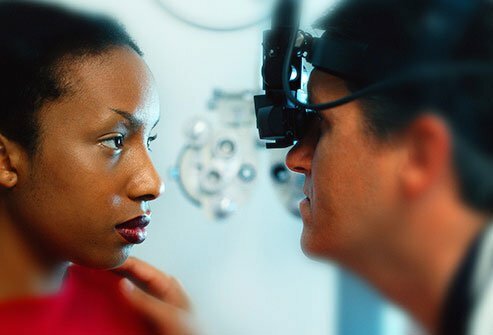 This type of light may even damage the cornea and impact vision. The cornea is a clear lens on the front of the eye. If you experience eye strain, pain, or vision problems related to smartphone use, minimize your use of these devices. The same goes for tablets, computers, and TVs. When you do use these devices, take frequent breaks to rest your eyes. Doctors and other health care practitioners are not immune to smartphone distraction. 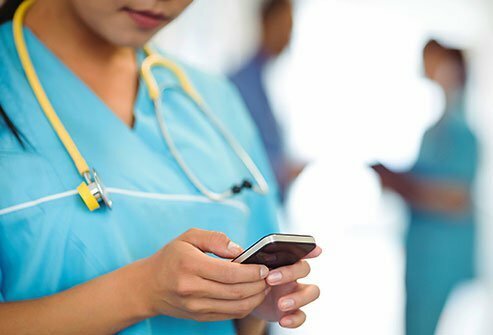 Evidence from one study shows practitioners are more likely to make errors that negatively affect patients when they are on their smartphones. The study showed that when practitioners are interrupted by a smartphone just once during a patient visit, mistakes in checking symptoms and in proper treatment each go up by at least 12%. Ask your practitioner to set smartphones aside when you have your appointment. 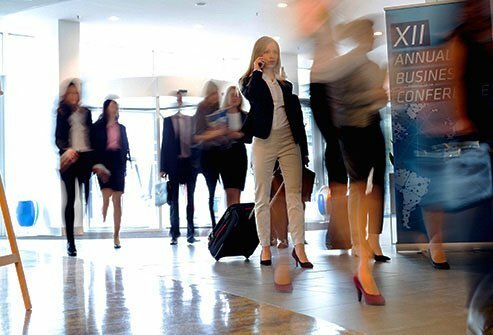 People who are distracted by smartphones when they are with others miss out on important in-person interactions and connections. Believe it or not, even the presence of a smartphone when people are interacting in person decreases closeness and trust between people. It also reduces people's ability to feel empathy and understanding from those who they were with. The presence of a smartphone disrupts bonding and intimacy. Put your smartphone aside when you are interacting with others in person. National Cancer Institute: "Cell phones and cancer risk."